Gideon's Wall is a fantasy novel by Gideon's Wall. After being promised that there would be no dwarfs, elves or wizards in this fantasy book, I decided to give it a chance. Not that I've anything against dwarfs, elves or wizards but most fantasy authors seem to be going round and round without getting anywhere. Staying clear of most of the standard characters, may do the trick. 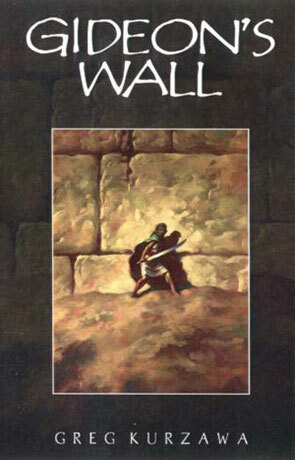 Gideon's Wall, takes the fantasy story back to where fantasy started; the adventure and the desert. Once upon a time there was an empire called Shallai, but then it suddenly disappeared. Gone. All it's people gone and it's cities crumbling as if they had been untended for a thousand years. An Archaist comes to investigate, and soon we get the story of what happened to not just the Shallai, but also the Bedu. Must of the story is told from the viewpoint of Del – a Shallai ambassador to the Bedu people. The Bedu is mostly beduins, living in and of the desert. The Bedu was once at war with the Shallai, and to protect them self the Shallai build Gideon's Wall. A rather brave move from Kurzawa, in these days, to choose “rag-heads” to be the hero's of his tale. Well done! A good bit of the story is Del settling into the Bedu culture and taking us with him, until the day things start to go wrong and the beginning of the end is at hand. The rest of the book is a bit more action oriented. Kurzawa set out to do something new and I think he succeeded. It's refreshing to read something that stays totally clear of the usual trapping of modern fantasy. There's nothing formulaic about this and you never get the feeling that it's written with the help of a set of dices and a role-playing manual. Kurzawa writes well and once he gets started it's hard to put this book down. Maybe there's hope for fantasy after all? Written on 16th June 2003 by TC.